Passive Solar Home design uses the Sun's path across the sky during different seasons to take advantage of Sunlight in Winter and block out the Sun in the Summer. Click HERE to access an article with more information on Passive Solar home Design. We will look at 6 different forms of alternative energy in class. 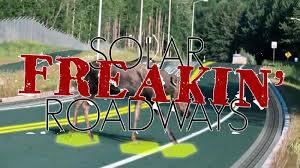 Click the picture above to watch a short video about a super cool, solar-powered, idea.